Welcome back to Blackboard News You Can Use, your brief monthly newsletter to help you promote student success through MATC’s web-based learning environment, Blackboard Learn. In this edition, we would like to share with you our schedules for upcoming training opportunities and a few updates. The faculty support liaisons are your first point of contact for Blackboard how-to questions, assistance, and helpful workshops. All faculty are invited to attend a one-hour Blackboard workshop to earn 1 CEU hour that counts towards FQAS! Contact workshop leaders directly if you have questions. 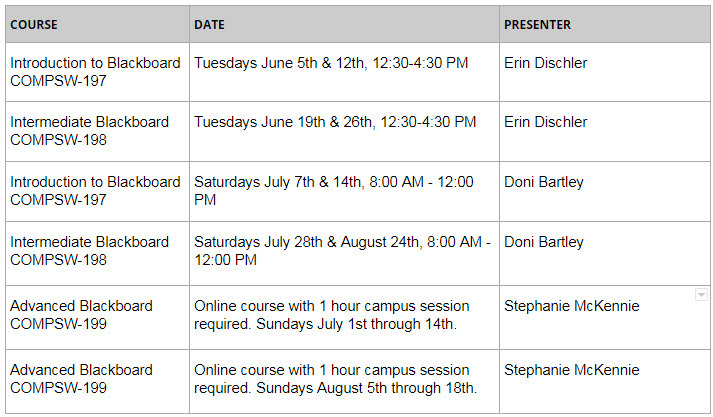 If you have a teaching appointment for summer or fall 2018, you will begin to see your assigned course sections appear in Blackboard starting this week. Course assignments are automatically pushed to Blackboard within 24 hours once they are assigned in INFOnline. If you have questions about your course assignments, please follow up with your associate dean. Remember – your upcoming summer courses will begin with the ID prefix SU2019 and fall will begin with FA2019. This is how the automated process with INFOnline generates the courses, which cannot be changed. Faculty who are looking for training in the use of Blackboard in their teaching are encouraged to enroll in a 1 credit free professional development course this summer at the Milwaukee Campus. Each course has additional online requirements. You will be able to search and register for these courses in INFOnline soon. The Course List in Blackboard lists all semester courses, master courses, and test courses to which you have access. To improve access to older course records, semester courses will now remain in Blackboard for a duration of seven (7) years past course end date. To manage the information in your growing Course List, you may hide, show, and reorder courses using these instructions. These changes do not impact course enrollments or availability. When using the Safari 11 web browser on a Mac to upload files in Blackboard, faculty and students may experience a “failed to submit” error message. This is a known issue caused by a recent Safari update. If you experience this error in Safari, please use an alternative web browser, such as Mozilla Firefox or Google Chrome, to upload files successfully. This entry was posted in Bb News for Part-Time Faculty, News by Megan Hamilton. Bookmark the permalink.